Because two doors are better than four. ‘TIS THE AGE of minimalism and living with less so we have decided to apply this downsizing principle to this week’s crop of cars. Why have four doors when two will do? Here are some of the most coolest two-door models that are available to buy on DoneDeal, from the dream car to the (slightly more) affordable. Although there are only two doors on the Mercedes-Benz E-Class Cabrio it actually has four seats so you can bring your friends along for the open-top ride. The low, wide stance of the E-Class gives it real road presence and it looks very elegant and glamorous too. As will you when you get behind the wheel. The Jeep Wrangler Overland is the perfect utility vehicle for active families and those who like to get off the beaten track (and back on it again) in safety and style. 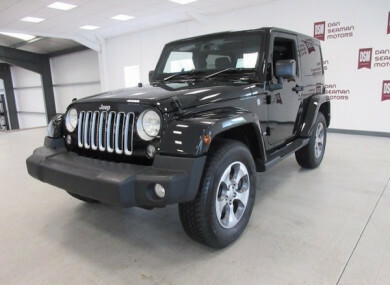 This Jeep is just made for adventures and its hardtop convertible roof turns the cool factor up to eleven. Fiat’s 124 Spider roadster takes its inspiration from the glamorous motors of the 1960s. It has good looks, good handling, and a great sounding 1.4-litre four-cylinder turbocharged petrol engine. This car is brimming with character and is a real head-turner. The MINI Cooper S 3-door is a hoot to drive and comes with some impressive technology. It is what you would call ‘serious fun’. This particular example comes with metallic paint and the feature-rich ‘Chili Pack’ and upgraded 18-inch Cone Spoke alloy wheels. This 2015 Fiat 500 is cute, funky and stylish but it has a lot more going for it than just that Italian flair. This one is well specced with loads of extras and is powered by a 69hp 1.2-litre petrol engine mated to an automatic gearbox. Email “5 of the tastiest two-door cars to add style to your driveway”. Feedback on “5 of the tastiest two-door cars to add style to your driveway”.